Models Own has taken the concept of scratch ‘n’ sniff to a new level with nail polish scented like your favourite fruity desserts. 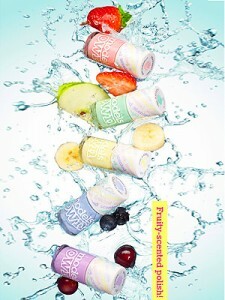 This spring your nails can smell as sweet as they look with this delicious fruit pastel range. Each pot is infused with a subtle fruity fragrance which activates once the polish has dried on the nail. Grape Juice – pastel purple. Models Own is known for being creative with nail varnish shades, even encouraging customers to submit photos of their own kooky nail designs to the brand’s website. Now you can create your own combos – how about Banana Split with deck-chair-style streaks of Blueberry Muffin? Or Apple Pie with Grape Juice polka dots? Fancy being even more daring? Why stop at your nails; if you’re fair-haired, why not opt in for the pastel hair trend currently sweeping the globe? UK actress Helen Mirren recently proved that pale pink hair doesn’t have to be gimmicky, while Kelly Osbourne’s been rocking the metallic lilac look since last year. We’re all young at heart and with this range you can go further than ever before by experimenting with scents as well as shades. And, at just £5 per bottle, it’s possible to bag the whole Models Own range for less than the price of one designer polish. Unleash your playful side this spring with Models Own Fruit Pastel Collection, available from the 9th March and in Boots from the 22nd of March. No polish looks good if your nails are scraggy, broken and generally unkempt. Get a manicure or pedicure before applying your nail polish for professional-looking nails.